Orka Park Detached Villas in Hisaronu for sale offer a great opportunity to own a large 3 bedroom villa on a prime site. 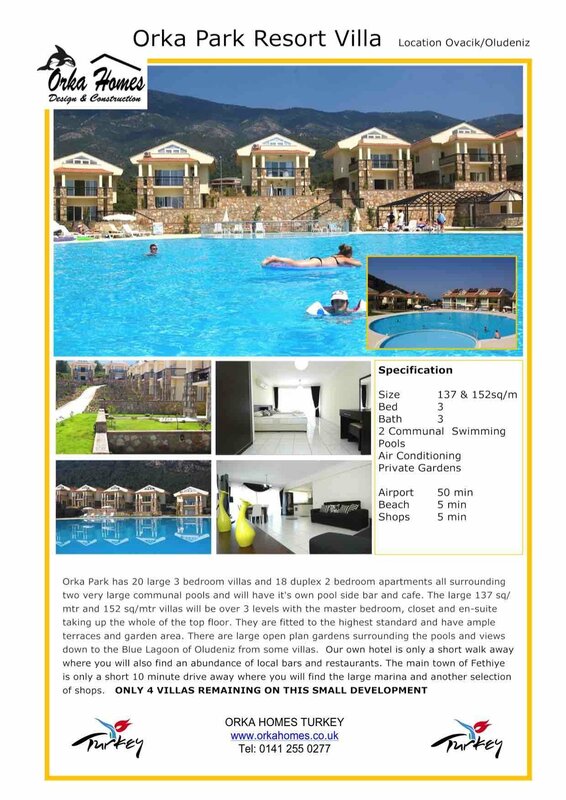 Promoted by Thomas Cook in their hotels brochure for anyone wanting a great rental income. Orka Park is a wonderful project of apartments villa in Hisaronu for sale. The project is situated in the Ovacik Valley at the foot of the majestic Babadag mountain. Due to its unique location amazing views can be enjoyed of the mountainous panorama and the Aegean sea. It is an ideal project for those that appreciate the tranquility that nature offers and high service standards that are provided within the project. The complex has an extremely large swimming pool and also a children’s pool, bar, restaurant and 24 hour reception and security. The villa has a very large split level long, kitchen and dining area with many windows and doors leading out to the front garden. There is also a downstairs W/C. Upstairs on the first level there are two double en-suite bedrooms with terraces and on the third level you will find the large master bedroom with full en-suite and dressing room area.